Last week, I presented part of my MAP research and did a quick demo of my app for the audience. It was a great experience and I enjoyed getting to interact with the audience and answer questions afterwards. Here are my slides, with a transcription of my talk below each slide. SLIDE 1: Hello! My name is Eric Mistry, and I’m a senior History Major and Technology Studies Concentrator. I am here today to talk to you about my yearlong MAP project, which I like to call the MAP MAP APP. 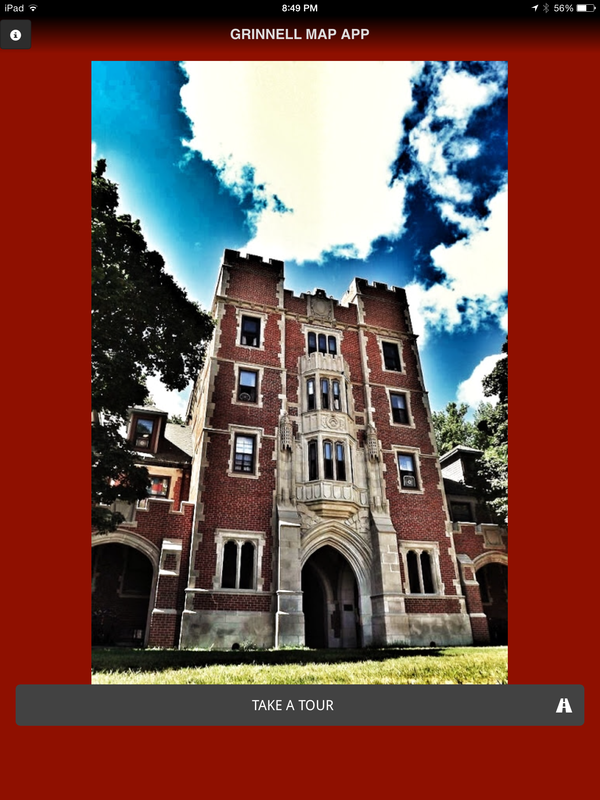 SLIDE 2: My project is a smartphone and tablet app designed to make exploring the history of the old and current buildings here at Grinnell College easy and accessible. 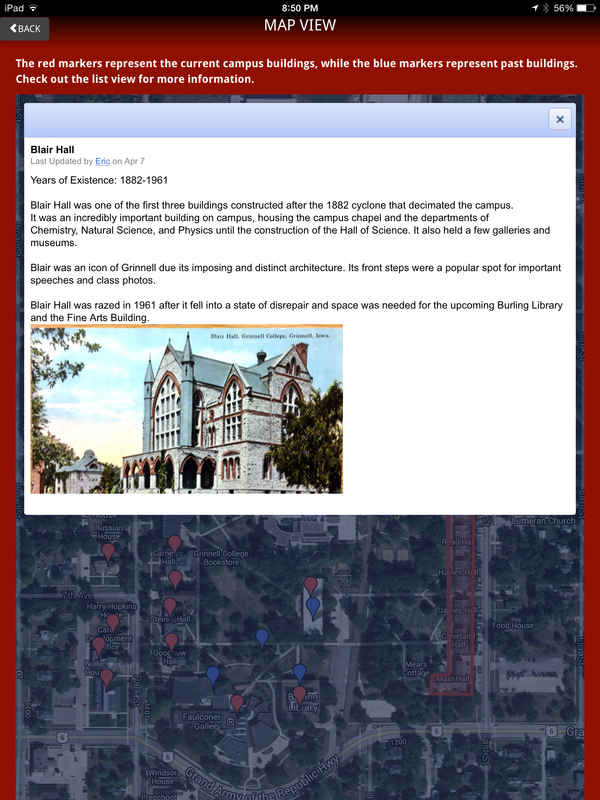 It contains two main components, a Google Map of the old and current campus buildings, as well as a section that contains indepth historical information and more pictures. SLIDE 3: My talk today will cover a few components of my project. First, I’ll examine the questions of Grinnell’s past and present that led me to my topic of research. Next, I’ll explain a bit about the Digital Humanities, and how this upcoming field has really influenced my project. After that I’ll explain how my MAP advisor, Sarah Purcell, and I came to decide that building an app was a better fit for the project than my original plan to have an ebook. Finally, I’ll explain a bit about learning how to build an app, and the many resources I found along the way. We’ll then see a brief demo of the latest app prototype. SLIDE 4: Something I’ve come to realize with my research is that campus is incredibly fluid, as students, we exist here for four years, just a brief moment of the College’s history. I came into this project really interested in seeing how the changing buildings on campus affect student life. My grandparents came here in the early sixties, my Grandpa is a chemistry professor and my grandma ran the Forum. 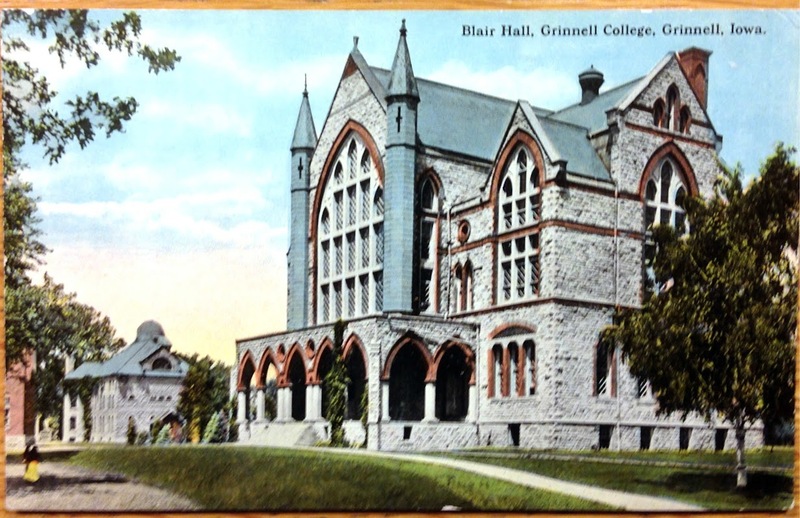 The Grinnell they arrived at is very different than the Grinnell of today. In fact, many of the buildings that were here upon their arrival are now gone or completely transformed. My dad came here from Mumbai in the early 80s as a student, and his stories of Grinnell revolve around the Forum and the PEC. My campus life revolves around the JRC, the Bear, and East Campus, none of which were around when my dad went here. I’m curious to think of what the campus will look like when its my kids or grandkids coming here. Norris will still be here, but what else will be? 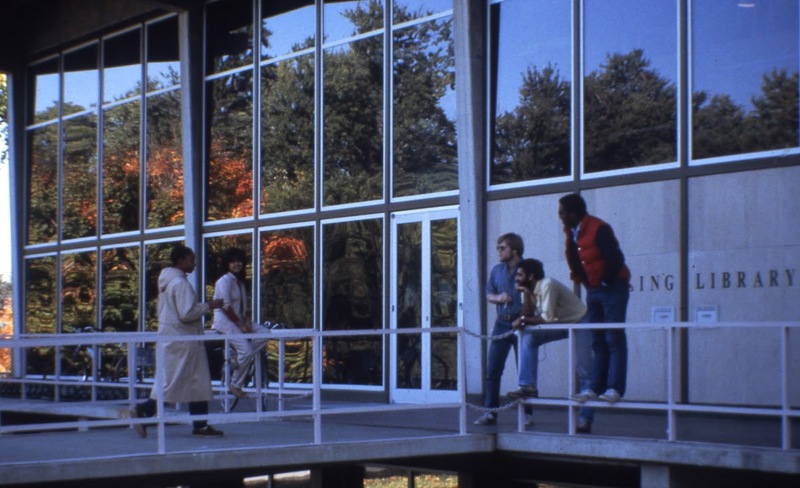 SLIDE 5: As I dove into researching the college buildings, I found a wealth of incredible information hidden in the archives, buildings that once dominated campus life were forgotten. I’ve even seen this history disappearing from the recent campus. The PEC was demolished my first year, now almost no students on campus have any idea what it even was. We have an incredibly short institutional memory due to only being here for a brief flash of time. That led me to the question, “How can this history of the college be spread and preserved?” A history paper or display just would not cut it. I found the answer thanks to a little help from the Digital Humanities. SLIDE 6: A relatively new field called digital humanities is asking a similar style of question. Here’s a brief definition from Matthew Kirschenbaum- “The digital humanities, also known as humanities computing, is a field of study, research, teaching, and invention concerned with the intersection of computing and the disciplines of the humanities. It is methodological by nature and interdisciplinary in scope. It involves investigation, analysis, synthesis and presentation of information in electronic form. It studies how these media affect the disciplines in which they are used, and what these disciplines have to contribute to our knowledge of computing.” In short, it’s a field that looks at what happens when the humanities meets technology and the two create something new. In our discussions of the digital humanities, my MAP advisor, Sarah Purcell, and I came to find a few key tenets of the digital humanities. 1. Make something new 2. Combine new and old methods 3. Use data in new ways & 4. Engage in interdisciplinary work.It was these tenets that led me to decide to make an app. SLIDE 7: Originally, I intended to write a history of each of the college buildings and present the information in an ebook, making distribution incredibly easy and making my project “digital”. However, as we talked, Professor Purcell and I realized that there wasn’t very much of the philosophy of the Digital Humanities in this idea. The form may be digital, but at heart, it was just another history paper. We focused on the tenet of making something new and thought about ideas to use the data in new ways. We then started thinking about making an interactive ebook, at which point the now obvious idea to create an app was suggested by Professor Purcell. We both thought it was a great way to create something new and engage in some interdisciplinary work. There was only one small problem to solve. I had about zero programming experience. SLIDE 8: Luckily, I had some design experience, and a wealth of tools and resources helped me along the way. The main class that helped me in building the app was TEC295- a course I took last year on Value Sensitive Design. I used the lessons learned in that class to identify my primary stakeholders, those who would be using the app, and realized the app had to be easily accessible on whatever technology they had, and it had to be very simple to navigate. This led me to try to find something to program apps in HTML5, which is the main programming language that many websites are built in. It can display content on a wealth of devices, so I thought it made a good choice. That led me to discover a software platform called Intel XDK (an unexpected Grinnell connection right there!) It essentially lets me program the app once, in HTML5, and then packages the files so I can build apps for iPhones, iPads, Android devices, Facebook apps, Chrome apps, and many more systems. I had found the perfect tool, now I just needed to learn to program. I learned HTML5 and a few other necessary programming languages using a service called Codecademy. Codecademy is a free, online-learning resource that teaches you code at your own pace by using instructions and actual coding projects to help you learn. While it is no replacement for a computer science course, it was crucial in helping me learn. Besides the Intel XDK and Codecademy, my biggest resource was Grinnellians, from my advisors who checked in on my project regularly, to Catherine Rod and Chris Jones in the archives, who helped me unearth the treasures, to the offices of admissions, ITS, and communications for their assistance, to my fellow students, who helped test the app, and in the case of some of my AppDev floormates, helped me fix a few minor issues before they became major issues. In short, I had to learn a ton to actually make this project happen, but it’s also been incredibly fulfilling. It’s also been interesting to see these new technical skills mixing with the traditional skills of my humanities background. I was still doing pretty standard historical research, including using the decidedly non-digital technology of the card catalog to work my way through the archives and find this information. All of this normal research combined with my newfound (and still somewhat weak) programming skills to create a unique project, my Grinnell MAP Map App. Without further ado, here’s a quick demo of the latest app prototype! APP DEMO: We start out at this intro page. Let’s take a tour! 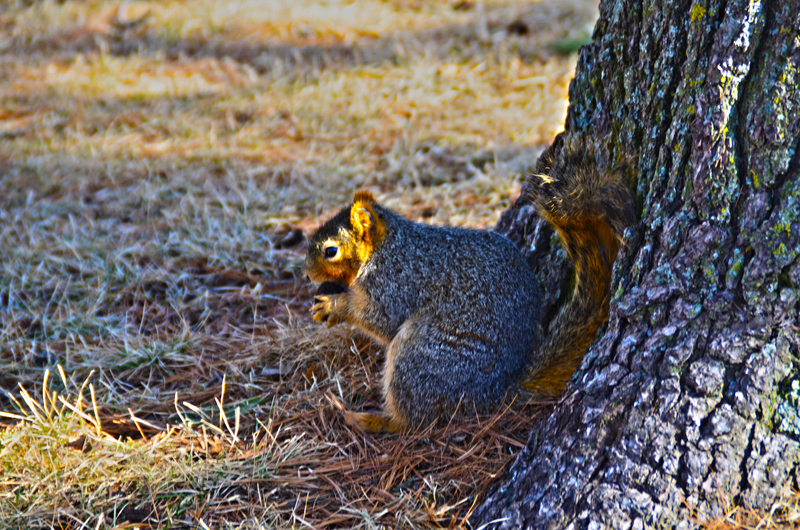 We can choose from either a campus tour or a historical tour. Let’s check on the historical tour. The map view is my personal favorite part of the project, so we’ll start there. The map you see here has two types of markers. 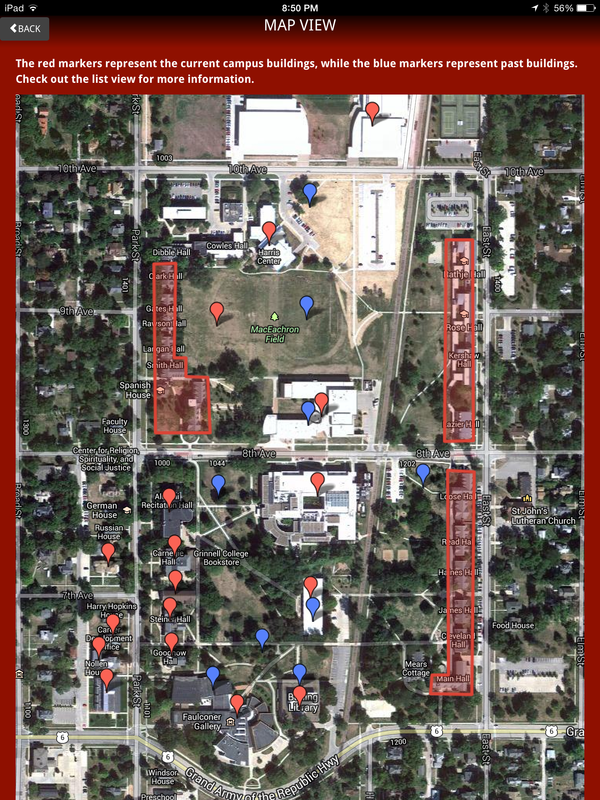 The red markers are the current day campus buildings, and the blue markers are buildings that no longer exist. When you tap on a marker, you get some information and a picture. If you want more information, I’d encourage you to check out the list view. 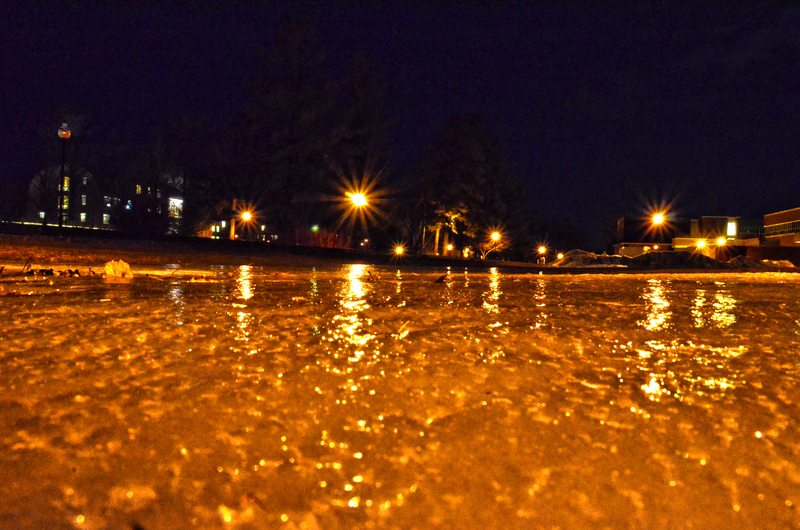 Here’s north campus, for example. 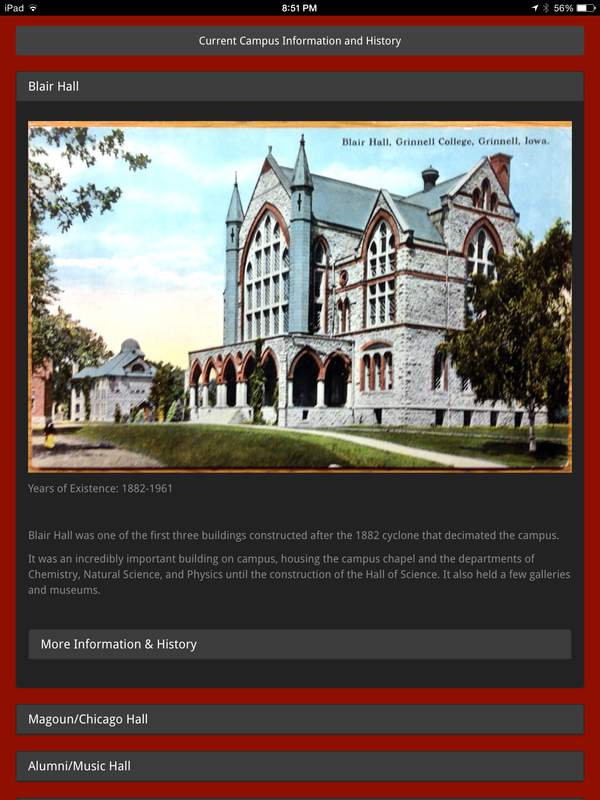 For a building from the past, here’s Blair Hall. Now, I’ll take us briefly back to the historical list view, so we can see a bit more information and pictures. … On this section, we simply tap on the name of the building we want to explore. Take Blair Hall, for instance. It was one of the first three buildings built after the cyclone in 1882. 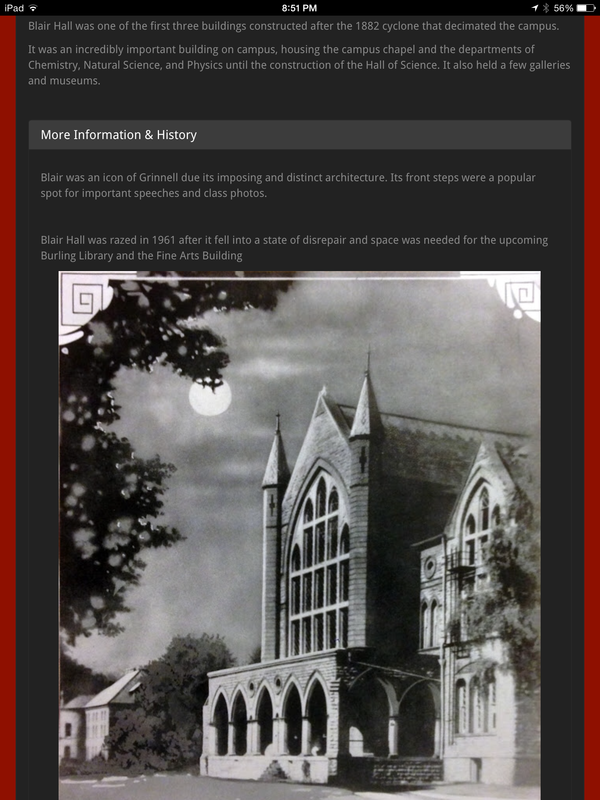 Here’s some more historical information, as well as some more pictures of the building. That’s unfortunately all we have time for today, but I will be presenting my full MAP research, as well as the finished app, on the evening of April 29th in ARH 302. To me, this app is a different way of presenting history- with huge potential for changing the size of an audience. If I had written a paper, or even made a small exhibit covering the same material, it may be read or examined by those who are interested in the topic, but would likely end up buried in an archive. 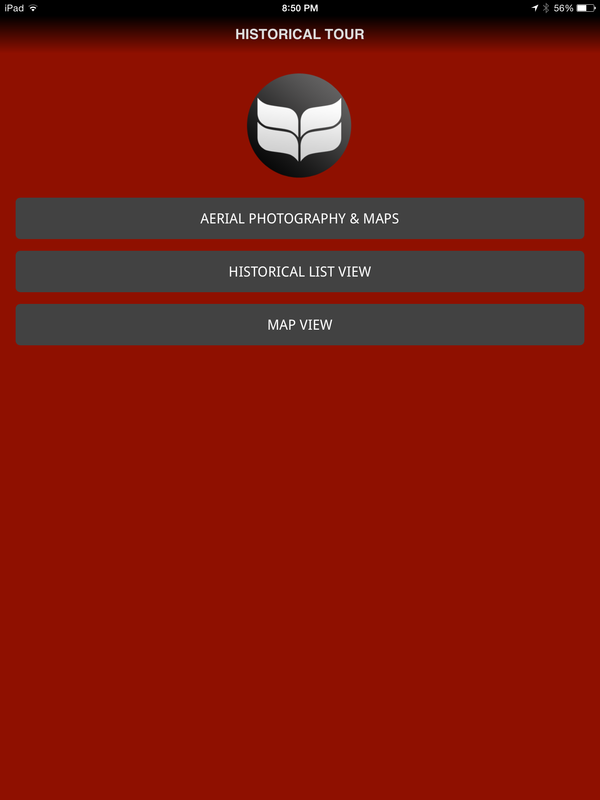 With this app, the history is placed directly in one’s hands, whether on a tablet, or a smartphone, or even a computer. Because of that, anyone can look at it or find it. It’s also easier to navigate an app than to read a paper, which lowers yet another barrier to entry. As app creation becomes simpler, I’m willing to bet we’ll see it expand into academia as a common product of research. It also makes interacting with the data so much easier. This initial project, this foray into the Digital Humanities, has not been easy, but it has been fulfilling. I went from having zero programming experience to creating an app in a semester. I also had the unique opportunity to combine my two passions, history and technology. They don’t often mix, but when they do, the results can be wonderful. Thank you very much. Social media is slowly but surely becoming a part of every student’s life. However, they’re not the only ones. Some Grinnell professors have turned to Twitter as a way to personally and lightly engage their students outside of just the classroom. “If I find an article that relates to a class I’m teaching, I’ll repost it using a hashtag that’s specific to the course that’s ideally going to create this sort of dialogue that will continue not just beyond the classroom, but beyond the course itself,” said Carolyn Lewis (@CaroHerbLew), History. Twitter has been seen as a viable forum for academic discussion and tweets are becoming increasingly relevant in academic discussion. Other professors, such as Dean Bakopoulos (@DeanBakopoulos), English, use Twitter as a way to help students ask questions they find relevant to the course or would like to engage outside perspectives and resources. Twitter is also an easy place for professors to simply share things that they find interesting or relevant to their students and peers and to find new information for themselves. But Twitter exchanges are not to be taken solely as friendly and trivial. Conversations on Twitter can also lead to connections and collaborations. One of the trickiest parts about social media for professors has been interaction with students. “I’ve made it clear I have no interest in following my students on Twitter. I remember when I first mentioned [Twitter], the looks of horror on people’s faces. But I always remind them, you shouldn’t be putting anything on Twitter that you wouldn’t want your professors to see,” Lewis said. Professors are also aware of the fact that the purpose of Twitter is not solely for academic research or exchange. For instance, Bakopoulos uses his Twitter feed to promote himself as an author, separate from his work as a professor. Bakopoulos also noted the difficulty of balancing personal and professional content on Twitter. While Lewis and Bakopoulos don’t see back and forth interactions with students as the standard use for their Twitter accounts, Purcell has welcomed it. One thing that the three professors did agree on was that Twitter was sparking conversations and spreading information in new and more efficient ways. Bakopoulos notes this method as being less formal and forceful than sending out class emails suggesting additional readings. Lewis and Purcell both praised Twitter for how easy it has made connecting to authors or other experts. In spite of its benefits and uses, Purcell sees Twitter as more of an aid to teaching, rather than a main vehicle for education. Health-conscious locavores have a new smoothie sipping spot to check out. 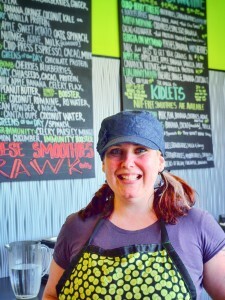 The Purple Cucumber is a quirky smoothie shop focused on fresh, local and vegan food. Melissa Lewis, the founder of the Purple Cucumber, was sick and tired of the overly processed, relatively unhealthy options, especially after going through a 12-month integrative nutrition course. “The basic principle of [integrative nutrition] is to avoid the frankenfoods … the additive-ridden, mutated food that we’ve been forced to eat because we have no knowledge of what’s really going on,” Lewis explained. As a parent, Lewis often encountered trouble finding nutritious and healthy foods in Grinnell, especially when time was short. “The options here for healthy food are pretty limited, especially if you’re looking for a quick snack that isn’t going to break the bank,” she said. Consequently, Lewis set about designing a smoothie shop that would serve healthful, nutritious and real ingredients in an environmentally and socially responsible way. However, throughout the process of preparing to open her business, Lewis kept in mind an overarching attitude of having fun. “One of the things that annoyed me about super health conscious people is how overly serious they can get. Let’s have fun with our food,” she said. The Purple Cucumber features a vast menu of healthy options with unique personalities. The main focus is on drinks, although a few tasty homemade snacks grace the menu, as well. The smoothie selection is creative, if slightly overwhelming, on first exposure. Luckily, that overwhelming feeling is simply a reaction to the impulse of everything sounding delicious. 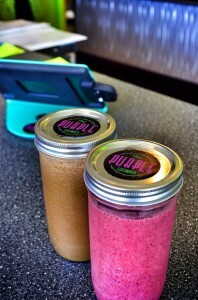 The menu has more than 25 different smoothie options, but custom smoothies are also available. The pre-designed smoothies, with funny names, such as “Joe Bananas,” “Luau In My Mouth,” and “Just Beat It” are extremely fresh and flavorful. “We’re kind of quirky and off the wall with some of our items’ names. We have a lot of satire humor,” Lewis said. 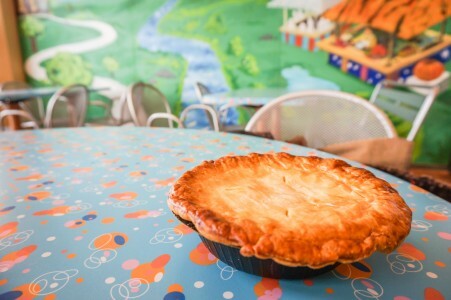 In addition to its delectable offerings, the business was intended to maintain environmental consciousness, as well as support other local and community businesses and suppliers—a feat verified by the Purple Cucumber’s menu. Much of the food is locally sourced and the Purple Cucumber plans to be a local Community Supported Agriculture pickup point soon. Also, the shop has a “Rockin’ the Reusable” promotion, which gives any customer who brings in a reusable container a discount on their purchase. They even sell large mason jars that fit the smoothies perfectly in order help a customer begin his or her own reusable collection. 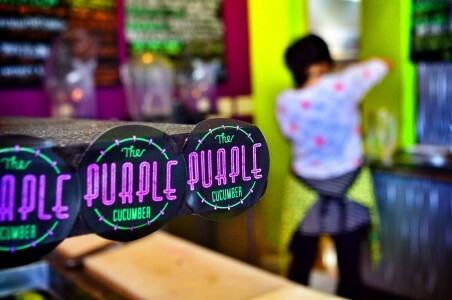 The Purple Cucumber blends the local foods movement, environmentalism, humor and delicious smoothies into an extremely enjoyable experience. Though it is tough to decide exactly which smoothie to enjoy, the fresh ingredients and creative combinations ensure that it should be fantastic. 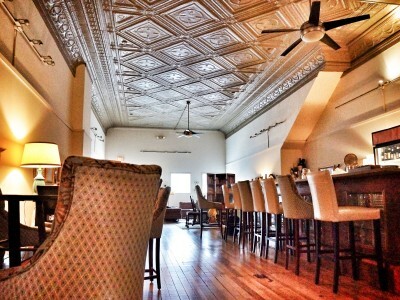 Colleen Klainert is bringing the big city to small-town Iowa with her new wine bar, Solera. A wine aficionado, Klainert has years of experience of both selling wine and running a wine bar. “I sold wine to wine bars and wine restaurants in the Twin Cities for years, and what I missed most living in small town Iowa was a big city wine bar. I missed a wine bar that had 50 to 60 wine selections. I missed drinking out of clean, crystal clear glassware, just relaxing with some soft jazz in the background,” Klainert said. Solera is a wine bar based around socializing. Everything in Solera—from the menu to the seating options—is designed to encourage relaxation and conversation. Klainert’s philosophy of looking at wine as something anyone can enjoy has deeply influenced the environment of Solera. According to Klainert, the world of wine should be accessible to anyone, not just connoisseurs. Ultimately, wine encompasses more than simply a drink. “I think its about making connections, about socializing. Wine facilitates socializing, but there is a common denominator … It facilitates getting to know strangers. Already here in three weeks, I have seen friendships starting across my bar,” she said. With the interior of Solera, Klainert has created a fantastic setup. The bar is huge and gently lit, and a variety of different sets of furniture round out the space. The front seating area is wonderfully vintage, with 60s-style furnishing and accessories. Other seating areas have their own unique, artistic flavors, including some Mona Lisa and American Gothic inspired collages on the walls. Some gentle music adds a bit of nice background noise. 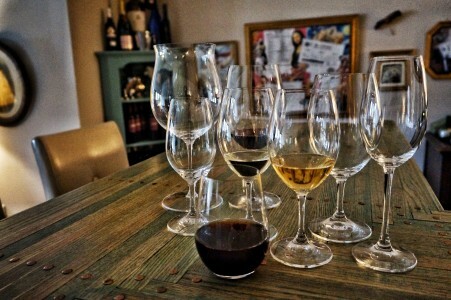 Wine is served in beautiful glassware, with specific glasses for each type of wine, something Klainert believes is absolutely necessary for the best wine experience. The menu at Solera offers a plethora of wines, with prices ranging from the economical to more luxurious choices better suited to celebrating. Most are sold by the bottle to facilitate sharing, but there are also nine by-the-glass options spread across the categories. There is also a limited food menu dedicated to options, such as breads, savory pastries and desserts that change regularly. Solera also offers a variety of high-quality beers either for individuals or for sharing. The menu is carefully curated by Klainert, who has honed her tastes for many years working within the wine industry. “If it’s not good enough for me, it’s not going on the menu,” Klainert said. Overall, Grinnell is gaining a true gem with Solera’s opening. The space is beautiful and imaginatively decorated, the wine and beer selection is superb and it promises to be an excellent space to meet and interact with a variety of people. Klainert’s past experience and expertise are demonstrated in the details that pepper the wine bar, from the eclectic collection of furniture, to the plethora of proper glassware, to the name itself. “Solera is a wine term. It implies a winemaking process by which some wine is preserved and blended into the next batch. I chose that word not only because it’s a wine word or because it’s easy to say, but I like philosophically taking something from your past and blending it into a better future,” Klainert said. Solera impresses from the start, and its future looks bright. Awards Unlimited, a local business that specializes in customized clothing and items, has come a long way since its humble 2003 origins. The co-owners, Stephanie and Andrew Hoopes, started out doing some embroidery and heat transfer apparel. Then, they moved on to trophy making and engraving plaques and now they have taken the business to the next level by adding on personalized and customized clothing. Awards Unlimited was the recipient of the Retail Business Award at the Grinnell Area Chamber of Commerce’s Annual Awards, which took place on Friday, Feb. 7. According to Hoopes, both she and her husband were notified that their business would be winning an award, but did not have any idea it would be one so prestigious. “It’s obviously an honor and it makes us feel like we’re doing good things and moving in the right direction,” Stephanie Hoopes said. The store, located on 931 Main St., offers a variety of products—both readymade and customizable. One of its main products is school spirit or athletic clothing for the local schools in the Grinnell school district, as well as state universities. According to Hoopes, the business has catered to making t-shirts for state tournaments for sports such as football and basketball. “It’s really fun to be a part of something people are so excited [about]. We take a lot of pride of getting involved in something so important to the community,” she said. Awards Unlimited also offers custom screen printing and embroidery for almost any type of clothing. Businesses and individuals are encouraged to request customized promotional materials of their choice. True to its name, the business focuses on producing custom awards and trophies as well. According to Hoopes, Awards Unlimited is very flexible in terms of customers’ needs and can therefore make anything from a single trophy to a whole set. “We’ll have parents come in wanting to recognize their child’s school achievements, to the local basketball teams and other small jobs like that. We also do big jobs, as well,” she said. Awards Unlimited’s most well-known returning trophy customer by far is the Iowa State Fair, as the business has been providing many of the fair’s trophies for the past few years. Trophies for the fair’s special events like the Bill Reilly Show, Monster Arm Wrestling and Bench Press are all courtesy of Grinnell’s very own Awards Unlimited. Although Awards Unlimited has found much success in retailing trophies, plaques and other forms of customized merchandise, the owners have expanded their scope of goods. The latest—and arguably most unlikely—set of products available at Awards Unlimited is its collection of boutique clothing. Hoopes, a strong believer in the benefits of local businesses, considers community enhancement and economic improvement two key contributions of small businesses. She explained that buying from local businesses keeps more money in the community. 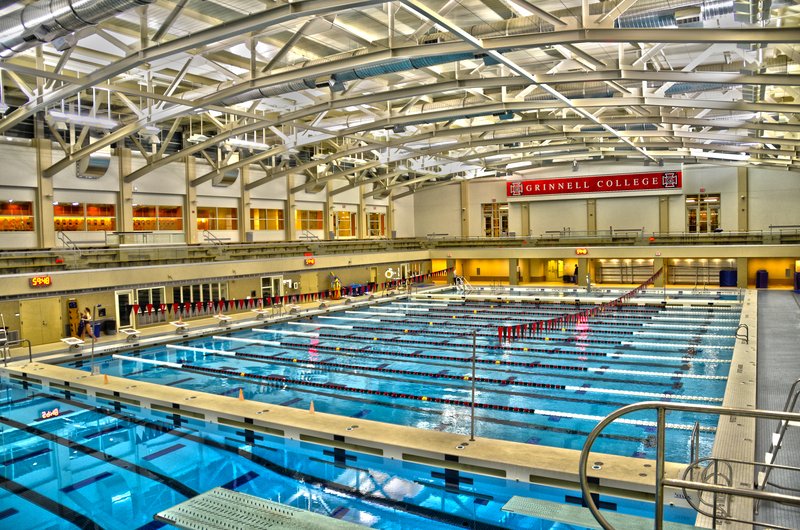 Grinnell prides itself in its economic diversity and Hoopes views this heterogeneity as a crucial foundation for a level playing field, further stressing that local businesses are able to offer equal or better quality compared to larger competitors, while providing more personalized service. “Just because we’re small town and a small company doesn’t mean we can’t also be competitive with the larger market. We welcome any job, small or large. We want you to be satisfied, to tell your friends, to come back again and again,” she said. See that guy in the yellow shirt? That’s my dad, Bomi Mistry, Grinnell Class of 1984. In any case, onto the usual business. My MAP project has been one of the biggest challenges I’ve ever faced, yet has simultaneously been incredibly rewarding. I’ve had to solve tough challenges, but it’s been giving me hope that none of the challenges yet has proven insurmountable. It’s been a blast to get to delve into the archives and uncover beautiful treasures from the past. I’m also excited to see how the app itself is received. To me, it’s a different way of presenting history- with huge potential for changing the size of an audience. If I had written a paper, or even made a small exhibit covering the same material, it may be read or examined by those who are interested in the topic, but would likely end up buried in an archive. With this app, the history is placed directly in one’s hands, whether on a tablet, or a smartphone, or even a computer. Because of that, anyone can look at it or find it. It’s also easier to navigate an app than to read a paper, which lowers yet another barrier to entry. As app creation becomes simpler, I’m willing to bet we’ll see it expand into academia as a common product of research. It makes interacting with the data so much easier. Here’s hoping to the continued growth of the digital humanities. This week, I’ll be giving a short presentation on my work over the past year as part of Grinnell College’s Humanities Symposium. (I’ll post my slides after the talk!) I’ll be sharing the session with other students taking unique approaches to humanities projects. It should be a great experience. As a special treat, here are a few of my other favorite images I’ve pulled from the archives for this project. 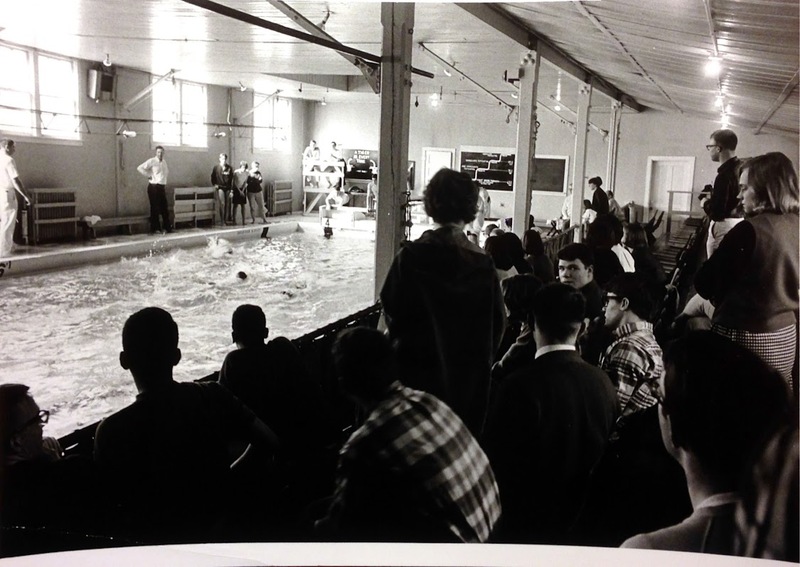 A swim meet in the original Grinnell College Pool. Four lanes wide and 20 yards long, it’s far cry today’s massive olympic-sized beautiful pool. 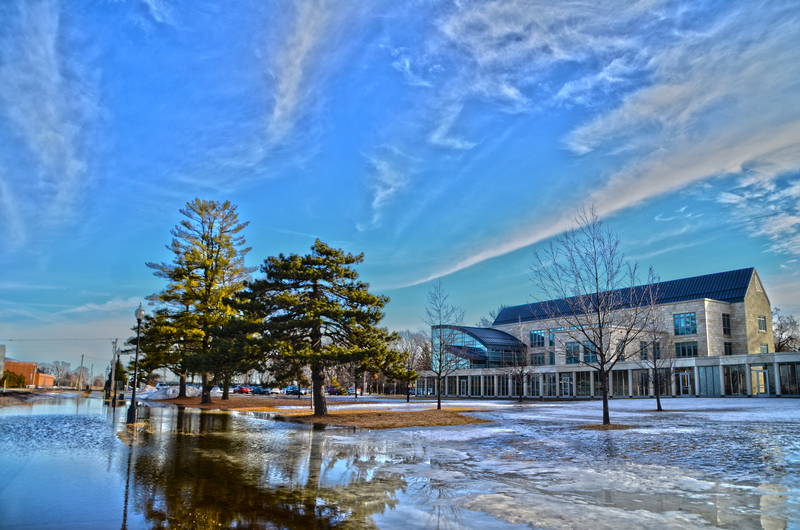 It’s a beautiful day here in Grinnell, Iowa. I’m continuing work on my programming project. My main problem that I’m trying to solve in how to place a clickable map inside the application. I’ve drawn up some plans for it and am trying to get the code to cooperate. Luckily, Google and other online resources are proving pretty useful for finding resources. It’s a matter of making all the bits of code work together. I like to think of it as working with a very complicated recipe. I know what ingredients I need, it’s just a matter of prepping them and cooking them into a delicious dish. There’s a lot of trial and error involved, but I’m feeling more and more empowered as I learn. That’s not to say that I feel like an expert, but its exciting that what used to be pure gibberish now makes at least some sense. I spent the whole weekend working on the code, and seem to be making progress. I’ve also been designing a series of posters for the wellness department and continued modifying app mockup drawings. 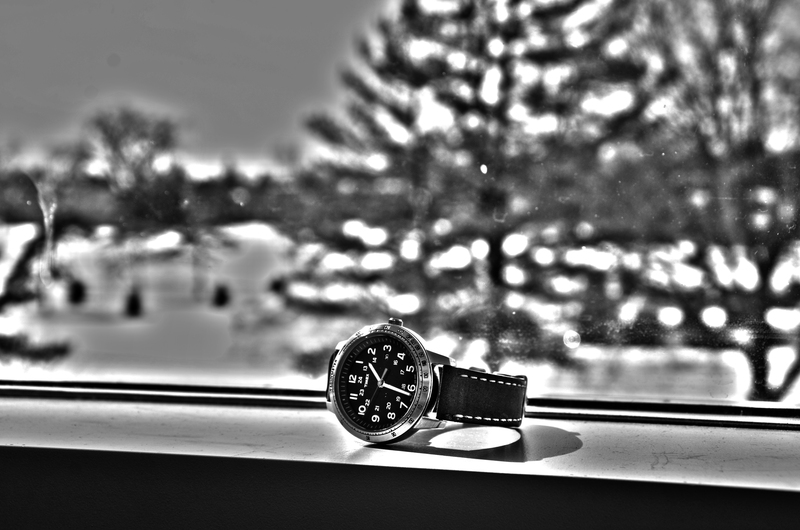 Today has been spent doing readings, planning, and organization… outside! It’s a balmy 58 degrees outside right now, so I’ve been taking advantage of it. 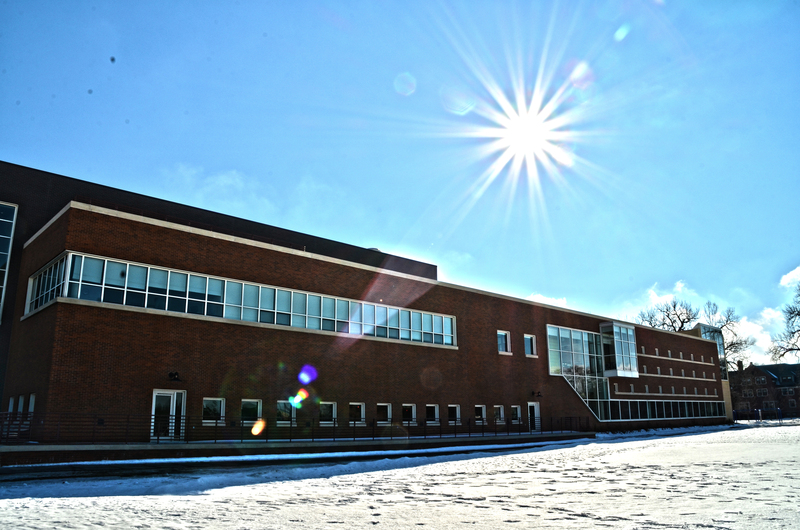 I’ve been soaking up the sun (and vitamin D) by working outside in front of the JRC. It feels great to just be outside after a long and freezing winter. 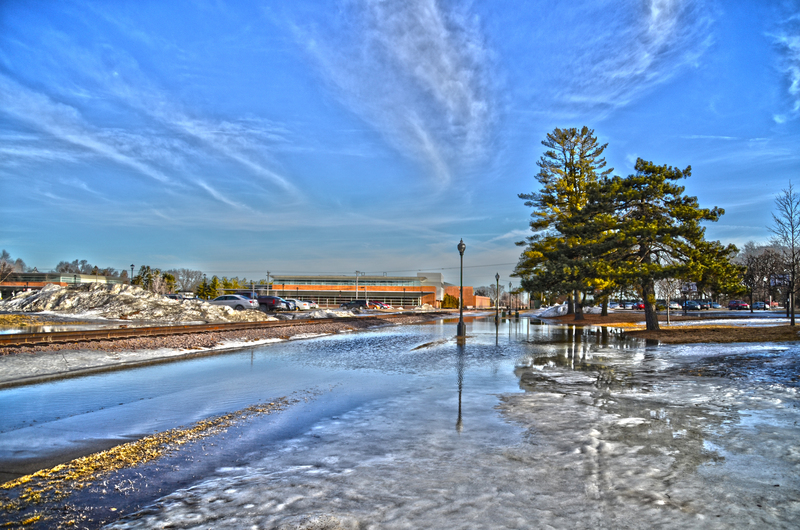 The snow is melting, turning parts of campus into lakes and rivers, which makes for some cool photographic opportunities.